To help the audience check for split ends in their hair, Parineeti demonstrated the ultimate needle test by passing a thread through the eye of the needle explaining that if their hair did not pass through meant they had split ends. 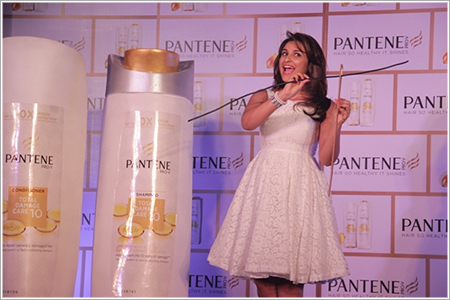 Leading shampoo brand Pantene on Wednesday brought actor Parineeti Chopra and Pantene Hair Expert Coleen Khan together for a event to share how she started endorsing the brand after it gave her proof, which no other brand did and demystify hair care myths! The event brought to life how beauty brands often make tall claims failing to deliver the results and it’s now time to move on from these false promises and to choose a brand that gives you proof. Parineeti proudly showcased that Pantene guarantees you 3 month split ends protection without making tall claims of instantly repairing split ends. The actor admitted she agreed to endorse the brand only after trying the product and being completely satisfied with the results. Chopra wholeheartedly commended the role of Pantene in letting her experiment with new hairstyles in her recent films, “I’m always pushing myself to take up different roles, new ways to seep into the character and this often requires me to change my look from film to film. Putting my hair through the various chemical and heat treatments would always leave my hair rough and dry and every month I would find myself running to the salon to chop off split ends!” she exclaimed. The Hasee toh Phasee actor had sported a fringe then and now for her upcoming film Kill Dill, she has coloured her hair. “Pantene has assured me that my hair will always be well protected,” the face of the brand said. The new Pantene range equipped with the Pro V formula technology restores hair and shine from within and not only provides intense moisturization as you wash but it also helps to prevent future damage. Pantene launches its new range of shampoo and conditioners, with total damage care, involving the best ever Pro-V formula which helps in improving hair health, strength and elasticity. Studies have revealed that Pro-Vitamins or PRO-V penetrate deep into the cortex of each hair strand. The two ingredients that make-up Pantene’s Pro-Vitamin complex - Panthenol and Panthenyl Ethyl Ether - are carefully coupled in the formulation to restore health and shine from within. Thus the result is nourished, beautiful, shiny hair. The Pantene product range includes different variants such as Total Damage Care and Hair Fall Control to meet your specific needs.